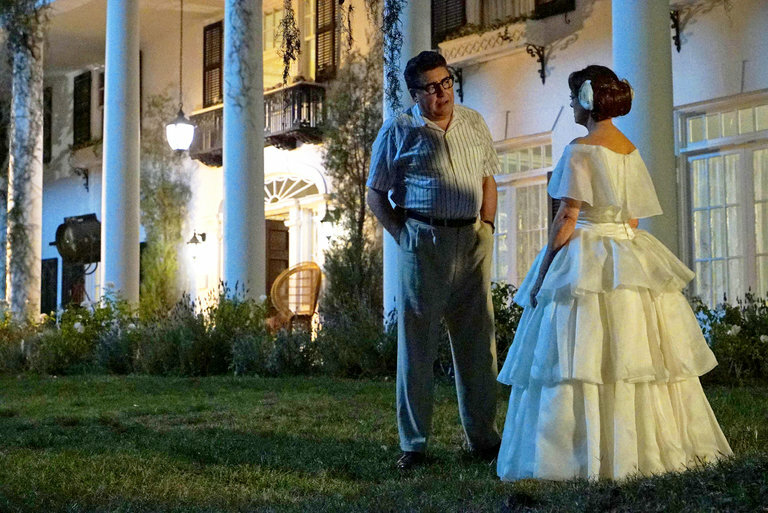 After watching Hagsploitation, the newest Feud: Bette and Joan episode, part of me thinks that in this war, the people behind it are pro-Bette. Part of me finds that my difficulty comes from certain aspects involving Joan Crawford that I wasn't sold on. However, as we come close to the end of Season One, we find that perhaps there's a sliver of sympathy for our Devil. Joan Crawford (Jessica Lange) has found work, but not the kind of elevated material she would like. Instead, she's shilling out for a low-rent B-movie, Strait-Jacket, created by schlock director William Castle (John Waters in perhaps the worst bit of stunt casting I've seen). She hates having to tour the country by wielding an ax (let alone having popcorn thrown at her), or doing some two-bit shtick where she 'chops off' Castle's head. She is also displeased that rumors of a stag film she allegedly made very early in her Hollywood time, Velvet Lips, is making the rounds...again. Her frenemy, Hedda Hopper (Judy Davis) lets Joan know oh so delicately that the stories are running around. Crawford knows exactly where to find the source of this blue film: her own brother, Hal (Raymond J. Barry), who lives to hold it over Joan's head (and as a ready source of blackmail cash). Things are not pleasant between them, but in the end all things worked out for her: Hal dies on the operating table, and when told this by Mamacita (Jackie Hoffman), Crawford calmly calls her banker to cancel the check. Robert Aldrich (Alfred Molina), director of What Ever Happened to Baby Jane?, is having problems of his own. His career is in the doldrums, and his wife has finally called it quits on their marriage. He might have found a lifeline with Jack Warner (Stanley Tucci), who wants to cash in on the 'hagsploitation' craze sweeping the industry (taking former glamorous stars and seeing them degraded). As it so happens, Aldrich has a script called What Ever Happened to Cousin Charlotte?, but Warner wants Crawford and Bette Davis (Susan Sarandon) to reunite. Aldrich knows that this will be a disaster as the two of them are beyond despising the other, but Warner insists. Aldrich for his part, pulls a few fast ones (after begging both of them to reteam). First, he appears to give them whatever they ask for: Crawford wants her name above Davis, Davis wants creative control. Second, What Ever Happened to Cousin Charlotte? will be made, not by Warners, but by Twentieth-Century Fox's Darryl Zanuck (who gave Aldrich a sweeter deal, and more importantly, respect). The gang's all back (even Baby Jane costar Victor Buono), but the two rivals simply can't let go of things. They make a genuine effort to have a united front to gain the upper hand, but nothing seems to work: Davis gets angry at Crawford's glamorous outfit for a script reading, her 'unintentional' posing for photographers, and at Aldrich's script. Crawford tries to put in her two cents but gets cut off by Davis, who storms out. Davis, however, will get her own once the crew goes to Louisiana for location shooting. Crawford and Mamacita have no one to greet them at the airport. They have no rooms for them until Davis 'graciously' finds them the smallest room possible. Worse for Crawford however is finding out that Davis has buddied up with Aldrich, who earlier had explained his woes to Davis. Perhaps Davis was genuinely trying to be kind to Aldrich as his twenty-four year marriage finally crumbled. To Joan Crawford, however, it was Bette Davis using every trick in the book to get the upper hand. 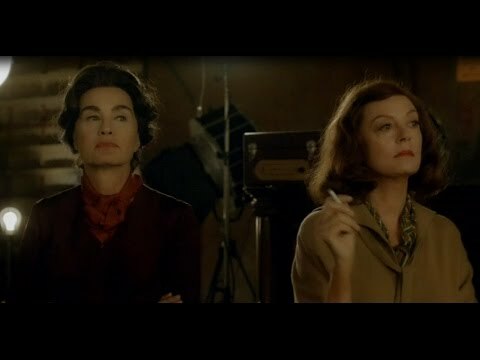 Hagsplotation is probably the weakest Feud: Bette and Joan so far for me because of certain elements. Once we have finished with their vicious brawl over Oscars, it made sense to see why What Ever Happened to Cousin Charlotte? (eventually retitled Hush...Hush, Sweet Charlotte) was made and the end result. However, part of me rejected part of the premise from the get-go. In Hagsploitation, Crawford is made to be incensed by doing such gimmicky bits for Castle, but from my understanding, Crawford was perfectly willing to go along with the theatrics. Perhaps it's because I happen to like Strait-Jacket and think Crawford gave a very good performance in the film that I find these protests of her 'failing' dubious. I think a greater dislike is the idea that Waters could possible be William Castle. Apart from their fondness for gimmicks and schlock Castle and Waters don't appear to be in the same universe. Waters looks nothing like Castle, and for me, the casting of Waters is just a stunt, a deranged cameo to please certain people, not to serve the story. Another aspect was playing Twilight Time when Warner talks about how it's twilight for him and the other moguls. A bit TOO on-the-nose, as if they were trying too hard when a touch of subtlety would have worked. Still, there were good parts. The story of Crawford's difficult family gave Lange good material, and seeing Molina's Aldrich finally stick it to the tyrannical Warner was fun. As the series winds down, Hagsploitation was to me less than the sum of its parts.